We had introduced the Vodafone R226 4G LTE Mobile Router last year. But we just introduced a few simple features. Today we get the sample of Vodafone R226 and we will test the new LTE mobile router. 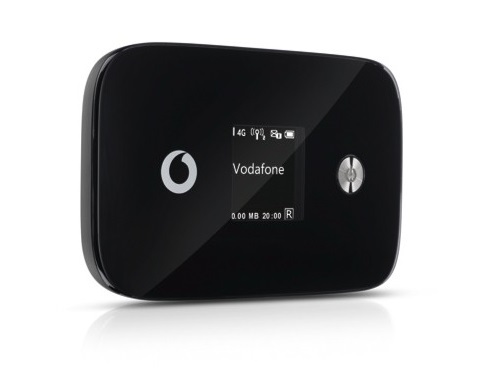 The mobile LTE Router Vodafone R226 is packed in a stylish cardboard box with the Vodafone design. In the package, there is a power supply for an output of 5V/2A and a USB cable to charge the battery and connect to the computer. A brief guide to setup as well as a small sticker with Wi-Fi name and password is on the back of R226. The design of the Vodafone R226 is very spectacular and it’s very similar to the Huawei E5786 and Telekom Speedbox LTE mini II. The reason is that the Vodafone R226 is manufactured by Huawei and comes from factory model Huawei E5786, so as Telekom Speedbox LTE Mini II. Due to the large Vodafone logo on the back and the front, the R226 could be immediately identified as Vodafone device. On the front there is a 1.45-inch screen and the power button. The button to turn on and off is illuminated, the press button to power on and offer. Compared to other mobile LTE hotspots such as the Huawei E5377, Vodafone R226 is a little bit large and heavy, which is mainly due to the strong battery. 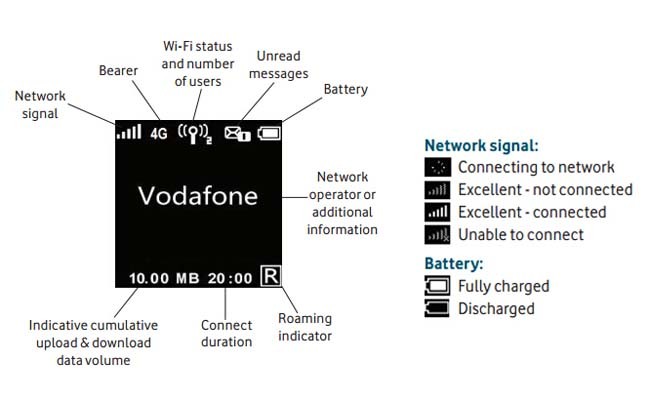 A few functions can be controlled directly from the display, the menu and power button of the Vodafone R226, for example, the choice of the WLAN frequency band. The important status information such as battery level, network availability, consumed data volume and online time are displayed on the easily readable screen. If you want do more adjustments, you have to do it either via a browser (address: vodafonemobile.wifi or alternatively 192.168 .0.1) or control it via the app. The Vodafone Mobile Wi-Fi app is available for both Android and for iOS and displays status information such as battery level and the data consumption. Manufacturer Huawei shows here with the HiLink app that it can be done much better, sleeker and faster, but unfortunately this app can only work with the Vodafone R226. The Web Interface is very fast when logging in it via a browser on the desktop. It is decorated in typical Vodafone design and is more reminiscent as a user interface of a wireless router. All functions and settings are provided with brief instructions in German, so there are also “normal” users to quickly setup the connection. The individual functions are divided into different categories, such as Wi-Fi routers and mobile broadband. A lateral sidebar always displays the current status information such as the reception level, no matter which side of the settings you currently are doing. The options are quite extensive, but not exceptional. So you can create another connection profile if you want to use a SIM card from another provider different from Vodafone (Vodafone R226 has no SIM lock). The network technology can be set, such as the “only 4G” in areas with weak signals. As can be seen on the menu, the Vodafone R226 is already prepared for IPv6, a corresponding profile can be selected. Up to 300 Mbit/s in the downlink on LTE network are possible via the Vodafone R226, at least in theory. The Vodafone network allows ideally a maximum of 225 Mbit/s, providing the LTE 800 and LTE 2600Mhz matching rate and corresponding radio coverage. But in the future Vodafone could also offer higher speeds on LTE Cat6. Since Vodafone R226 has no SIM lock, it could work well with other LTE network providers in Europe. In the test, unfortunately I could not test LTE-Advanced Cat6, since the corresponding technology was not enabled on my test site. But even without Cat6, the R226 router is very fast: up to 155 Mbit/s in the downlink and 44 Mbit/s in the uplink could be achieved. In addition, the Vodafone R226 LTE router supports both UMTS and GSM. In the UMTS network, DC-HSPA+ with up to 42.2 Mbit/s downlink speed is possible. The reception on both LTE (800, 1800 and 2600 megahertz tested) as well as UMTS is very good, the Vodafone R226 is without doubt one of the mobile LTE hotspots with the best reception. The Vodafone R226 has the possibility to connect an external antenna. These are two TS-9 connectors under a cover on the side of the hotspots. The built-in Vodafone R226 battery has a capacity of 3,000 mAh, the running time is about 9 to 10 hours. In continuous mode, the device is quite warm. Unfortunately, the battery is not replaceable by the user, although the back for MicroSIM and MicroSD card is removable. The WLAN module transmits not only in the range of 2.4 GHz, but also 5 GHz. This is particularly advantageous if the 2.4 GHz band is overloaded. Unfortunately, the R226 only supports Wi-Fi 802.11 a/b/g/n, the latest wireless standard ac is not supported. The maximum bandwidth over wireless is 300 Mbit/s when connected with multiple devices. This is very surprising, because the identical devices Huawei E5786 and Telekom Speedbox mini II LTE support Wi-ac with up to 866 Mbit/s. A serious disadvantage arising from the comparatively slow WLAN module: the full LTE Cat6 speed of 300 Mbit/s via WLAN does not begin to be used, so that the maximum speed of the USB 3.0 cable must be connected always. In practice, few users will interfere, but it is absolutely inexplicable why Vodafone and Huawei have installed this bottleneck. Here now Vodafone R226 is available on www.4gltemall.com with good price. If you like it, welcome to check more details about it.